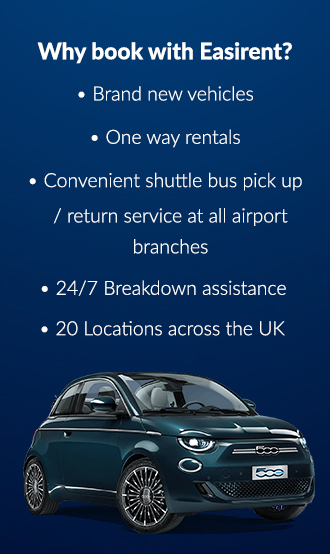 With airport branches in 24 locations Easirent is the best choice for affordable care hire in the UK, Ireland and Florida, US. If you are travelling to one of the airports then check our travel guide featuring information on the airport itself including practical advice on arrival and departure procedures and also what facilities you might be looking for during your visit. For holiday travellers, be sure to check our top restaurants and hotels guide where we list the best places to stay and eat – perfect for families and couples! Finally, no travel guide would be complete without the “top places to visit” section. Our team of intrepid writers have put together a comprehensive list of where to go and what to see including historical landmarks, places of interest and great shops to visit during your stay. Whether you are flying in for a short break or family holiday we hope you find the Easirent airport travel guide a handy companion – be sure to come back and check our new guides for more airport locations in the near future.